NARVIK, Norway (CNN) -- Fresh from medical school, Anna Bågenholm chose to do her residency in the Norwegian city of Narvik because of its spectacular mountain slopes. An expert skier, Bågenholm had gone off the trail with two other young doctors on a warm spring afternoon when she fell. Rescuers worked frantically to save Anna Bagenholm from a hole in the ice of a mountain stream. What happened that day in 1999 changed her life and has redefined what is possible in cases of accidental hypothermia. Bågenholm slid down a steep, icy gully and ended up submerged head first in a hole in the ice in a mostly frozen stream. Only her skis and Telemark boots and bindings protruded from the thick, opaque ice. As the 29-year-old struggled, her friends Marie Falkenberg and Torvind Næsheim began a frantic effort to free her, made impossible by a torrent of frigid spring runoff pouring over them into the hole where their friend was submerged. They called for help, starting a chain of events that is now part of medical literature and local lore. Bård Mikkalsen, a police lieutenant in Narvik at the time, took the call. "I told the operator, 'You must send the helicopter to here, and you have only one minute to decide it. You have to call me back. The time is running out.' " The dispatcher turned the helicopter around. Heading the rescue party from the top of the mountain, Ketil Singstad skied as fast as he could in the wet springtime snow to the spot where Bågenholm remained trapped under the ice. Singstad said he and others tied a rope to her feet and tried unsuccessfully to pull her free, and the snow shovel and small saw they had brought were no match for the thick ice. Then he saw another rescuer heading up the mountain with a pointed gardening shovel. Hear about the medical miracles that are saving lives in the face of death, taken from Dr. Sanjay Gupta's new book "Cheating Death." 8 and 11 p.m. ET Saturday-Sunday on CNN. Using that tool, rescuers cut a hole downhill from Bågenholm and pulled her through the opening. She had been under the ice for about 80 minutes. "I thought we were taking a friend, dead, out of the water," Singstad recalled. 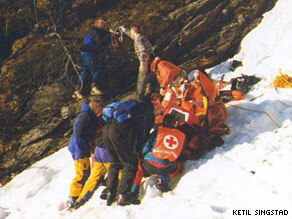 Bågenholm's ski companions, both doctors, began CPR and continued until the rescue helicopter arrived. The emergency crew winched Bågenholm up to the hovering chopper, giving her CPR and squeezing air into her sodden lungs as they made the hourlong flight to the University Hospital of North Norway in Tromsø. Dr. Mads Gilbert, head of emergency medicine at the hospital, was waiting on the helipad. "She has completely dilated pupils. She is ashen, flaxen white. She's wet. She's ice cold when I touch her skin, and she looks absolutely dead," Gilbert said. "On the ECG [electrocardiogram], which the doctor on the helicopter has connected her to, there is a completely flat line. Like you could have drawn it with a ruler. No signs of life whatsoever. And the decision was made. We will not declare her dead until she is warm and dead." Gilbert and the waiting team at the hospital were hoping the CPR that Bågenholm received after being pulled from the stream had provided enough oxygen to her chilled brain. When it's cold, the brain needs far less oxygen than it does at normal temperature, 98.6 degrees (37 Celsius), and Bågenholm was definitely cold. Her body temperature was just 56 degrees Fahrenheit (13.7 degrees Celsius). No one had ever been that cold for that long and survived. Rushed to Operating Room 11 at the hospital, surgeons rerouted Bågenholm's blood through a heart-lung machine and slowly warmed it. More than three hours after her heart stopped, Gilbert recalled watching the video probe of Bågenholm's heart. "It was standing completely still. No movement. I just saw some little shivering. No fibrillation. And suddenly it contracted. Pssh," Gilbert said, squeezing his fists to mimic a beating heart. "And there was a pause and pssh. A second contraction." Gilbert tears up at the memory. Bågenholm remembers nothing of the accident and adds that the event did not change her life. "I'm not so emotional. I'm more practical, I think," she says. Her case history made the prestigious British medical journal, The Lancet, and stands as a challenge to doctors confronted with victims of severe hypothermia. Næsheim, who is an anesthesiologist at the University Hospital of North Norway and is on the helicopter emergency medical team there, says the lesson from Bågenholm's case is clear. "It's the three important things about emergency medicine, which is never give up, never give up, never give up. Because there's always hope." The shovel that broke through the ice remains on the mountainside in Narvik, hanging from a tree next to the stream as a testament to the possible.